A stranger who swept in with comforting words. Another who carried a woman to safety. Amid the tragedy of Monday's attack in Boston, there were incredible acts of bravery, courage and kindness -- many done anonymously. Days later, victims and their families are trying to find the people behind those acts to thank them. A woman who suffered serious shrapnel wounds from the Boston Marathon bombings wants to thank the Army vet who calmed her down in the aftermath of the attack, and she got some help from a prominent figure on Tuesday: the Massachusetts governor. The woman, identified by the governor only as Victoria, was terrified and "hysterical" after she got struck. Patrick said she was carried to a medical tent near the finish line by Tyler, a firefighter who introduced himself to her as an Army sergeant and Afghanistan vet. "I don't know whether he was assigned to medical tent or, like so many people there and elsewhere in the commonwealth, just jumped in to help," Patrick said. 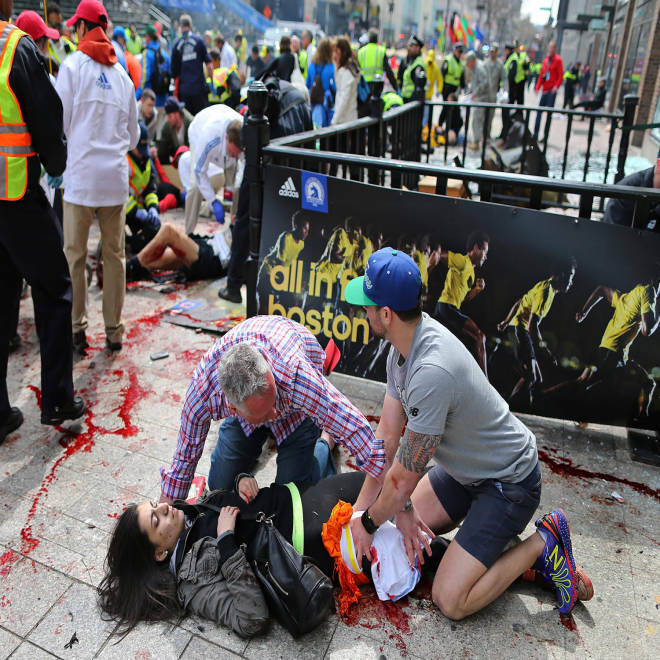 Bystanders come to the aid of 17-year-old Sydney Corcoran at the scene of the first explosion on Boylston Street near the finish line of the Boston Marathon. Victoria, who is a student at Northeastern University in Boston, was transported to Tufts Medical Center with a lower leg wound, hospital spokeswoman Brooke Hynes confirmed to NBC News. As of Wednesday morning, neither the governor's office nor Tufts Medical had heard from him. Sydney Corcoran, a 17-year-old Lowell, Mass., girl, woke up from surgery on the ruptured femoral artery in her leg with one request, according to The Boston Globe: "Find Matt." He was one of the two strangers who put a makeshift tourniquet around her leg as she lay on a bloodied sidewalk. Corcoran had been at the marathon to cheer on her aunt, Carmen Acabbo, who was running the race for the first time. Her mother, Celeste, was also gravely wounded by shrapnel; she had to have both legs amputated below the knee. Of Matt, the stranger who saved her niece, Acabbo said, "We would all like to thank him," according to The Globe. One hero who has been identified but not yet reached by family members of the wounded man he helped is Carlos Arredondo. 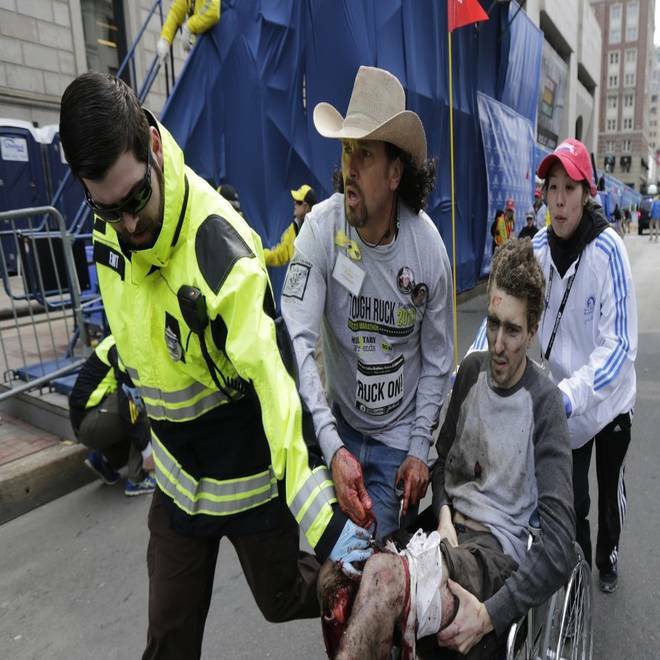 Arredondo, 52, was photographed in his cowboy hat, applying pressure to the bleeding thigh of Jeff Bauman, Jr., who was being rushed from the scene after his legs were blown apart. Bauman had to have his legs amputated but is expected to survive. Carlos Arredondo, seen in the cowboy hat on the left, attends to Jeff Bauman, Jr., after a twin bombing at the end of Monday's Boston Marathon.